Some people’s life path becomes evident already in their childhood. Such was the case of Hana Vášáryová, who was born on 12 August 1981 and clearly preferred horses in her early years; dolls and princesses didn’t stand a chance. When she rode a horse for the first time at the age of 9, her fate was sealed – no one would force her out of the saddle. Between Hanka aged 9 and Hanka today stand years and years of effort, experience, championship successes as well as bruises and scratches. The content smile on her face when she is walking into a full stable, grooming a horse or sitting in a saddle remains the same.She first encountered dressage thanks to Vlasta Kadlecová from the Přední kopanina riding club, where she trained from the age of 9 till 16. The first competition in 1996 (level Z1) resulted in a nice fourth place, prompting her to face the challenge and be better next time. Despite a difficult start, successes came and her dreams were about to become true. Hanka achieved her first valuable riding success in 2001, when she ranked second with Perun at the FEI test. The next few years brought about more fulfilled wishes. Among other things, Hanka did an internship with the respected Austrian rider Sonja Grossauer. Hard work, learning and competition successes bore fruit in the form of the Rider of the Year award bestowed on her by riding professionals. 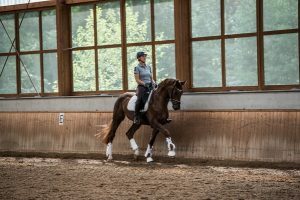 A crucial point in her career was her cooperation with the most prestigious dressage stable Kasselmann, where she had been for over a year at that time. In 2005, Hanka “popped over” from Germany to Czechia to finish her studies at the Faculty of Arts, Charles University. 2006 was a milestone year; Hanka and Ricco excelled at almost everything they put their minds to. Together they became Czech Champions, won the Czech Dressage Cup, received the Rider and Horse of the Year awards and won the Jezdectví cup. Hanka’s performance earned her the Gold badge. Apart from her success on home ground, they started to rank high in international competitions. 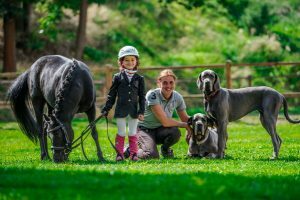 The following year, Hanka and Ricco had a small companion on their way to defending the Czech Championship title – the rider was five months pregnant with her first daughter Johanka. Hanka hasn’t left the top spots in competitions and polls since then. Her friends and family know that she is a relentless powerhouse. She must be, if she wants to do well in training, competitions and mucking out the stable. 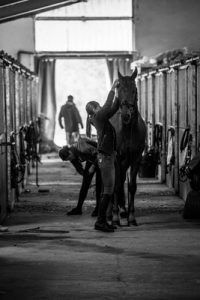 Caring for a club with over 20 horses (and together with her husband Tomáš for their daughters Johanka and Jasmínka) is a full time job. It is 365 days a year of never-ending effort and responsibility towards the horses and their owners. Luckily, she is surrounded by a team of great professionals who are as passionate about horses as she is. The coordination of the whole team is helped by the family atmosphere of the Jírovice riding club, which Hanka and Tomáš built by themselves from scratch in 2011. The fact that they live just a stone’s throw away from the stable shows how much of a fixture horses are in their life. When you visit Jírovice, you understand that dressage is not only about winning. Success counts, of course, but it won’t come without a harmony between the rider and their horse, synchrony, mutual respect and humility. Horses are not a means for collecting prizes; they are the riders’ partners and friends.